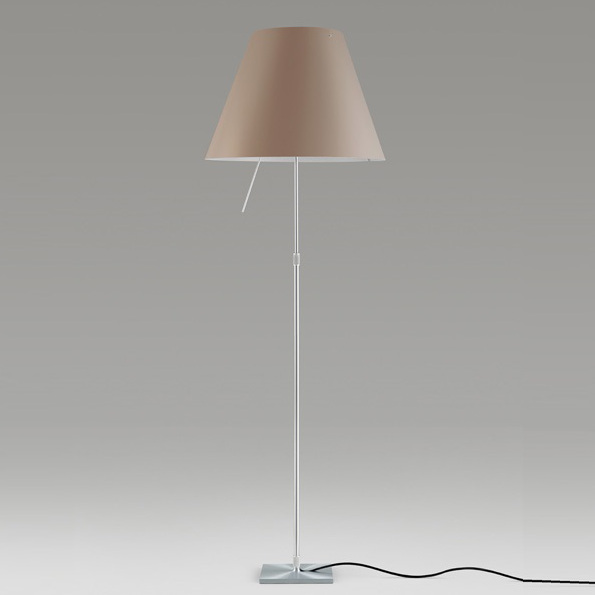 The Costanza Floor Lamp by Luceplan fits perfectly in any context. Designed by Paolo Rizzatto in 1986 for the Italian designer Luceplan, this luminaire has not lost its modern, playful chic. The slightly translucent shade is made of polycarbonate and is supported by an aluminium frame, which serves as a noble extra. The simple form focusses on the essentials and can be integrated easily into any environment. Thanks to its unobtrusiveness, the Constanza is a pleasant companion, that last but not least, convinces with its pleasant light game. The shade is optionally available in mystic white, soft skin, shaded stone, edgy pink, comfort green, petroleum blue, smart yellow, primary red, concrete grey or liquorice black. This variety of colours is typical of Luceplan who has been very successfull with its luminaires. The frame can be chosen in black, white or aluminium. With an adjustable height (max. 160 cm), you can perfectly adjust the Costanza as needed. Optionally, you can get a diffuser for a better light scattering when you use halogen lamps.